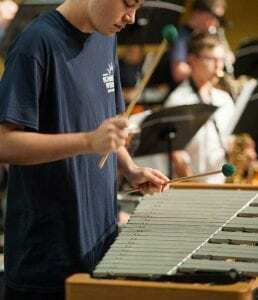 The Nashville Youth Wind Ensemble (NYWE) provides an ongoing intensive musical opportunity for high school musicians throughout middle Tennessee. NYWE is designed to be an enhancing and enriching experience, providing deeper study of wind band literature and supplementing high school band curriculum. The mission of NYWE is to positively augment instrumental music education, improve student skills as players and musicians, and to bring together students from diverse musical backgrounds to perform quality wind literature. NYWE is for high school musicians currently in grades nine through twelve who play flute, oboe, clarinet, bassoon, saxophone, horn, trumpet, trombone, euphonium, tuba, string, bass, and percussion. Advanced eighth grade students may be considered based upon teacher recommendation. Each member of NYWE is required to be a member of his/her local school band or orchestra if these ensembles exist; however, students who are unable to participate in their school band program may be considered under special circumstances. It is recommended (not required) that students have significant performing experience, are leaders in their band program, have studied privately, and have accumulated additional experience through mid-state or all-state selection. 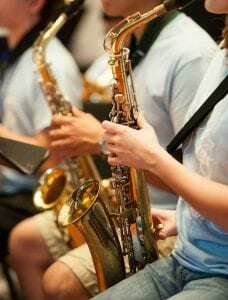 Woodwind and brass students must own their instrument or secure use of an instrument through their school band program. Percussion instruments will be provided; however, percussionists must own their sticks and mallets. The Nashville Youth Wind Ensemble rehearses on Sunday from 2:00-4:00 p.m. at Belmont University and performs two joint concerts with the Belmont University Bands. Additional performances may take place off campus during the regular season. Attendance is required at all rehearsals and performances. Prepare approximately two minutes each of two solos or etudes that demonstrate your technical and lyrical ability. NO ACCOMPANIST is required, and music does NOT need to be memorized. You may use mid-state audition excerpts. In addition, please plan to play a two-octave F chromatic scale. Please prepare two minutes each of a solo or etude on snare drum, marimba (2 or 4 mallets), and timpani. You may play mid-state audition excerpts if you are preparing for the audition. Instruments will be provided. Auditions will take place either in person (preferred) or via video submission (if unable to attend live auditions). All students must register for the audition by clicking here. Record a video of the material requested above. The student should face the camera so that the face, instrument, and hands are visible on the video. The student should introduce herself/himself and announce each selection played. Upload the video to YouTube and change the setting to ‘unlisted’ (allowing only those with the link to view it). The title of the video should be your first name, last name, and instrument. Email the video link to university.bands@belmont.edu by September 30, 2018. Audition results will be communicated to students via email within two days of the audition date.